FALLBROOK, Calif. – June 10, 2010 – Pala International today highlighted the opening May 15 of All That Glitters: The Splendor and Science of Gems and Minerals at the San Diego Natural History Museum, whose staff developed and designed the exhibition, which is scheduled to remain on display through April 2012. The Museum’s collection—highlights of which are displayed—is augmented by gem specimens and jewelry designed by Tiffany & Co., Cartier, and Van Cleef & Arpels on loan from private collectors, and institutions such as the American Museum of Natural History, Gemological Institute of America (GIA), Harvard University Mineralogical Museum, Newark Museum, and the Smithsonian. More than 80 pieces on display are from the collection of Pala International president Bill Larson. 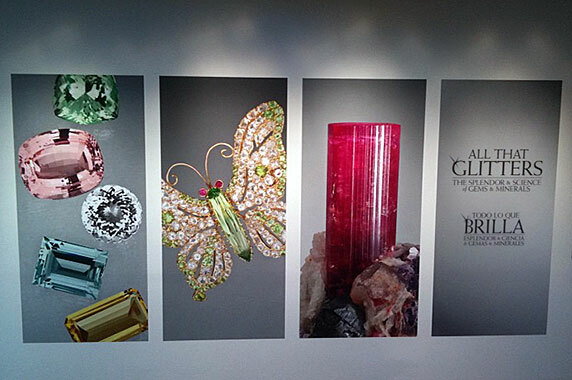 Larson’s son, Carl, contributed a dozen of his own specimens, including a tourmaline from San Diego County’s Stewart Lithia Mine, which is featured in the exhibition entrance’s photographic montage; son Will Larson also lent specimens. Making this a family affair, Bill’s wife Jeanne Larson, executive director of Fallbrook’s Collector Fine Jewelry, contributed exemplary jewels to the displays. 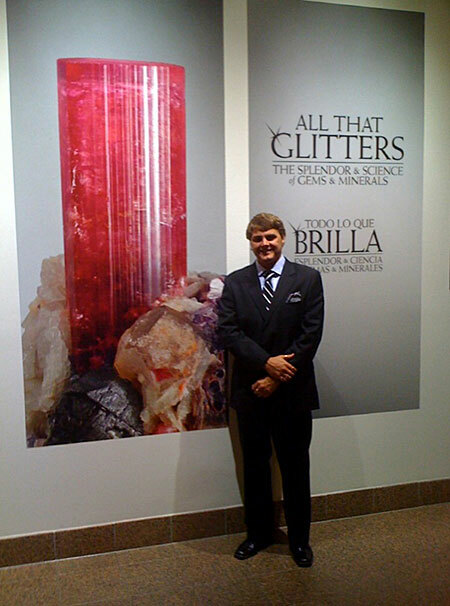 Carl Larson and a poster of his own tourmaline specimen, from the Stewart Lithia Mine in San Diego County. The displays showcase classic workmanship and signature elements related to specific styles and time periods. Exquisite gem carvings include a Fabergé gray chalcedony pig with diamond eyes, a jellyfish opal brooch by Mauboussin, Cartier diamond panthers and tigers, and a never-before-seen collection of 13 butterfly brooches set with rare gems such as alexandrite, flame spinel, sphene, rhodochrosite, Mexican fire opal, pearls from Baja California, topaz, rainbow moonstone (transparent labradorite), and sapphire from Montana. 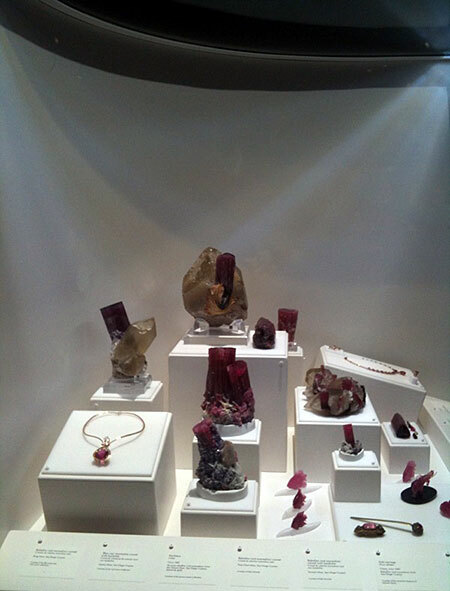 The centerpiece of the show is gems and minerals of California, with San Diego County’s tourmaline well represented, alongside spessartite garnet, kunzite, topaz, morganite, aquamarine, quartz, opal, scheelite, colemanite, covellite, sphene, herderite, and jade. 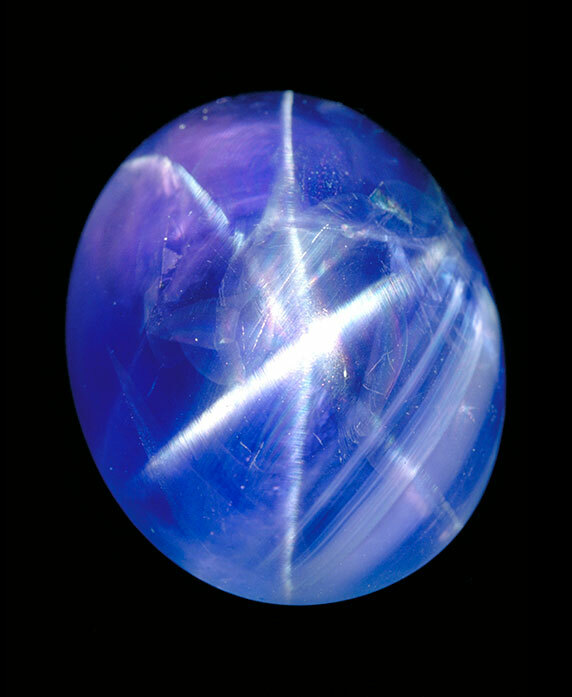 The rare state gemstone, benitoite, also is featured. Objets d’art also abound, with “The Carousel Egg,” a jeweled enamel egg containing a miniature replica of the carousel outside the San Diego Zoo in Balboa Park. 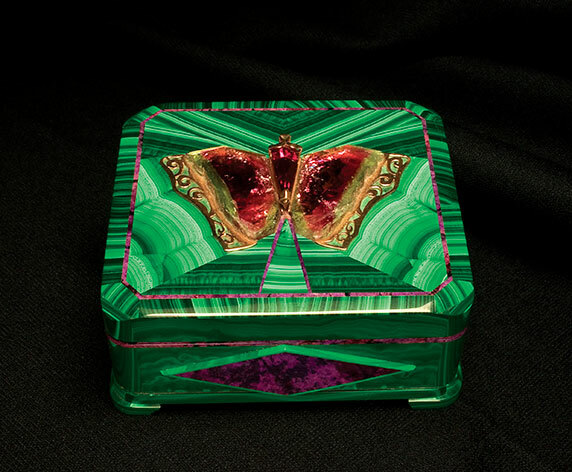 Intarsia boxes include a “butterfly” teakwood box inlaid with malachite, sugilite, tourmaline, and gold. See the exhibition website: http://www.sdnhm.org/exhibits/allthatglitters. See also The Collector Fine Jewelry website: http://www.collectorfinejewelry.com. 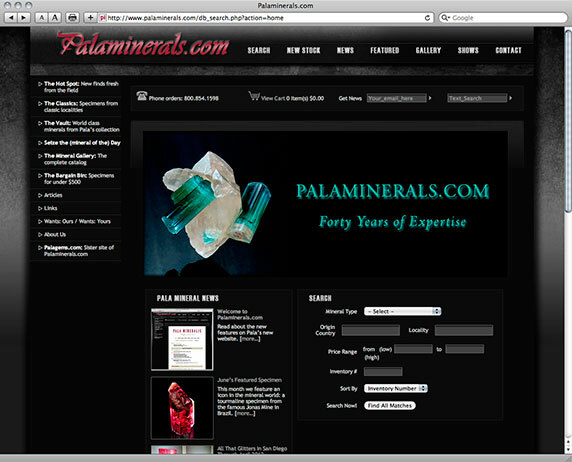 FALLBROOK, Calif. – June 10, 2010 – Pala International today announced the debut of the firm’s website for the mineral enthusiast: Palaminerals.com. Proportional Thumbnails: Using on-the-fly thumbnail creation, the new website renders each thumbnail proportionally. In-Place View Swap: Users can swap views of a single specimen by clicking the detail thumbnails to the right of the large view. Autosuggest in Mineral Search: Enter two letters of a Country or Locality and Mineral Search autosuggest does the rest. Running Shopping Cart Total: The total displays on every page. Pala International’s Will Larson, webmaster David Hughes, and Fallbrook IT pros Stephen Calia and Brent Dussia guided the project through design and scripting phases. “Plans are in the works to do just that,” Hughes explained. For forty years, Pala International Inc. has consistently earned its reputation as the direct source for the finest colored stones. Numerous annual trips to the world’s major gem-producing centers enable Pala International’s staff to select from an impressive inventory. In addition to tapping the world’s resources for fine colored stones and mineral specimens, Pala has long been involved with mining tourmaline in San Diego county. Pala International’s slogan is “The only way to sell quality is to buy it.” That, and the fine customer service offered, make Pala International your number one source for colored stones. The firm’s gemstones and mineral specimens are among the finest in the world, having been sold to some of America’s most famous jewelers. Clients include Tiffany & Co., Neiman-Marcus, Borsheim’s, The Smithsonian Institution, American Museum of Natural History, Los Angeles County Museum of Natural History. For more information about Pala International, contact David Hughes, News Editor, at david@palagems.com.